An old friend returns and I was so excited to see him. If you've read the book that started all of this - and if you haven't, why haven't you - then you will recognize Lieutenant Paul d'Arnot as the brave Frenchman that Tarzan rescued in Tarzan of the Apes and who then introduces him to civilization. This time around he is seeking help for a friend whose son has been lost in the jungle. The son, Brian Gregory, was on an expedition looking for a huge diamond known as the father of diamonds and Papa Gregory has come with his beautiful 19-year-old daughter, Helen, to try to find and rescue him. d'Arnot was in his twenties in the first Tarzan book and in the meantime Tarzan and Jane have borne and raised a son and are grandparents. That means that d'Arnot must be at least 50 now, so what is he doing panting after a 19-year-old? This is Edgar Rice Burroughs though, so logic does not apply. Speaking of lack of logic, this is the third or fourth book with a Tarzan-look-alike. This time around it's Brian Gregory himself that so closely resembles Tarzan that even his family is fooled. This is a plot device that is introduced mostly to give the woman involved with the villains a reason to take Tarzan's side at critical moments. Later in the book it is completely forgotten. I wonder if that was because this was serialized and ERB couldn't go back and rewrite that part when he decided he didn't want to follow up with it later. The world will never know. A kidnapping leads Tarzan, d'Arnot, and others into the jungle and adventure. The villain of the piece is trying to beat them to the diamond and this time around he's not Russian but Eurasian. Did Tarzan ever meet an evil Brit? I can't recall. I know there were bad Americans, lots of bad Russians, a few bad Swedes, and plenty of evil Germans and Japanese in the books written in either World War. But I think he continually cast the Brits as allies and/or victims. 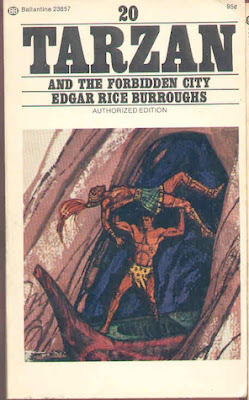 One of these days I want to read the Edgar Rice Burroughs biography I bought from a used bookstore and maybe I'll find clues in it as to why ERB was such an anglophile. One truly unique points to this book was a lot of the action takes place underwater with magical ERB scuba suits. I love underwater everything so that was a nice change of pace. This was one of the books when Tarzan has a beautiful woman throwing herself at him and he never bothers to mention that he already has a wife (or she, if you prefer) and isn't available. I really do wish that ERB had treated Jane with more respect. To be fair, Tarzan doesn't encourage these women, he's just so manly and awe-inspiring that the women can't help falling for him. I can't really blame them, can I? Other than d'Arnot, this was a thoroughly forgettable Tarzan book. I just finished it two days ago and I already couldn't tell you a thing that happened once the action swings into high gear. (Swings, get it? Because Tarzan swings... never mind.) The funniest part of the book for me was listening to text to speech and having the computer render d'Arnot's name as "darn it." If you aren't a completist or a complete Tarzan nut, you can skip this one. Three stars with at least one star awarded for the return of d'Arnot.